Sharing some exciting news about our recent American Farmhouse Style magazine feature! I’m so darn excited, y’all! We have been featured in a magazine!!! Squeal! Pinch me so that I can truly believe it! We have a 4 page spread of last year’s Christmas front porch in the premier Christmas edition of American Farmhouse Style! I am truly honored. To be selected for a magazine feature is a dream come true. And to be featured in such a beautiful magazine is amazing. 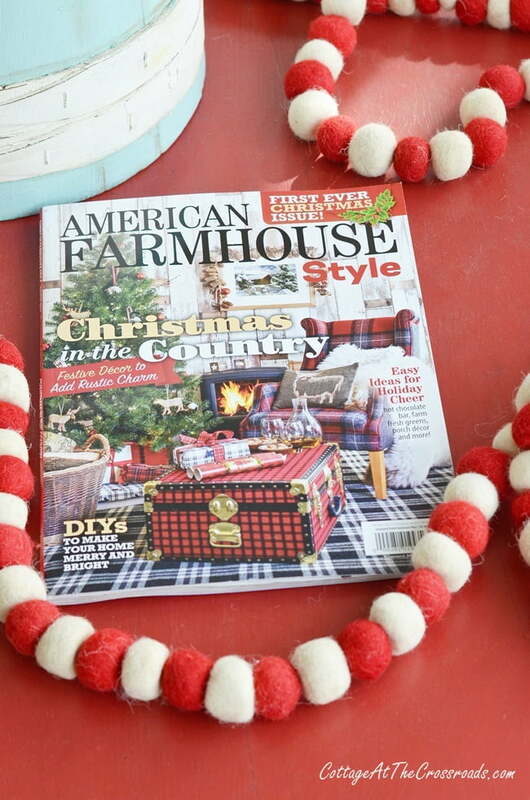 American Farmhouse Style magazine has been in publication since 2014. It always has drool worthy farmhouse decor photos with decorating tips along with DIY projects. It is absolutely one of my favorite magazines! 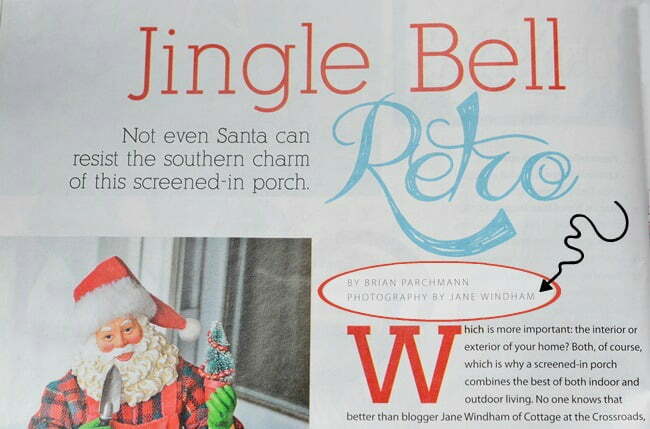 In August, I received an email from the editor who was interested in featuring our front porch in the first Christmas issue. Oh, lawd, YES! So I submitted some photos thinking that they would change their mind, but to my delight, I received another email asking to be interviewed for the feature. To understand how much this means to me, you’d have to know that I’ve been a magazine junkie all my life. It all started with me reading the only magazine that came to our house when I was young. It was The Progressive Farmer, a country life magazine. You see, I grew up in a REAL farmhouse with a red metal roof. I know the farmhouse style intimately. You just can’t get the country out of this girl! Although, as a young adult, I ran as fast as I could from the farm lifestyle. I subscribed to magazines such as Vogue and Cosmopolitan. Setting up housekeeping, I discovered home decor magazines such as Country Living, Colonial Life, Country Home, and Southern Living. And today, I still subscribe to a number of magazines and always check out the special editions at the grocery or book store. After retiring from a 31 year career in teaching, I discovered blogs and promptly started one primarily to record what we were growing in the garden and as a way to preserve family recipes. Never did I ever think that a magazine would feature us. But, this right here, where the black arrow is pointing, is what I am most proud of. The magazine credited me with the photography!!! Oh my goodness! I have struggled with my photos. I knew nothing about photography when I started blogging, and I continue to struggle to this day. Currently, I am taking an online photography class to improve. 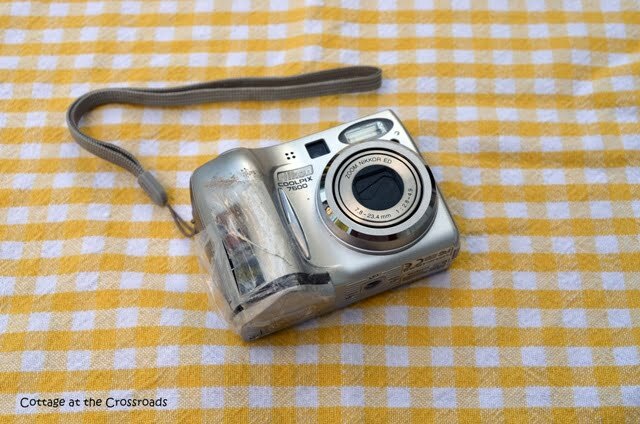 For the first year or so of the blog, I used this point and shoot camera. You can see from the photo that I just about wore it out! It was a big step when I got my Nikon DSLR camera. All those years of reading and looking at magazines did train me to recognize a good photo when I saw one, but mastering photography has been difficult for me. So to have my photos published in a magazine is just unbelievable! You can imagine how excited I was to actually see the magazine on the shelf at my local Walmart last week! 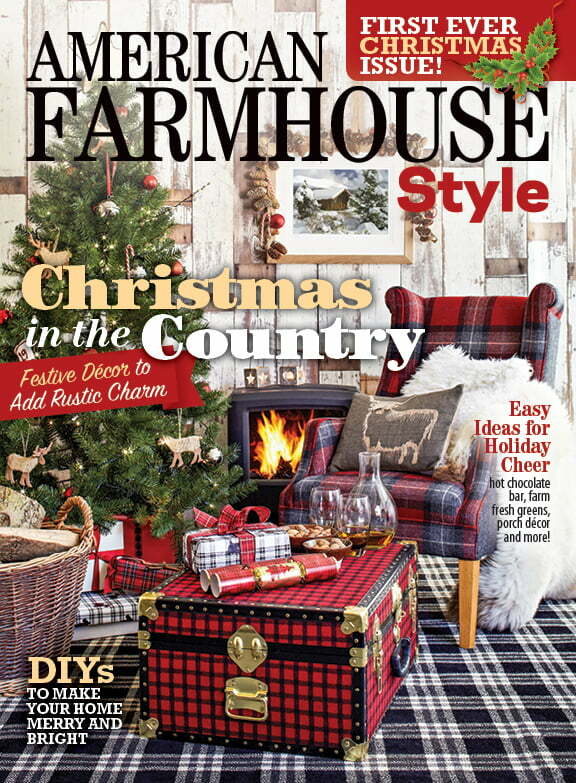 It is a beautiful edition jam packed with Christmas decorating ideas with a little something for everyone-even if you don’t live in a farmhouse! 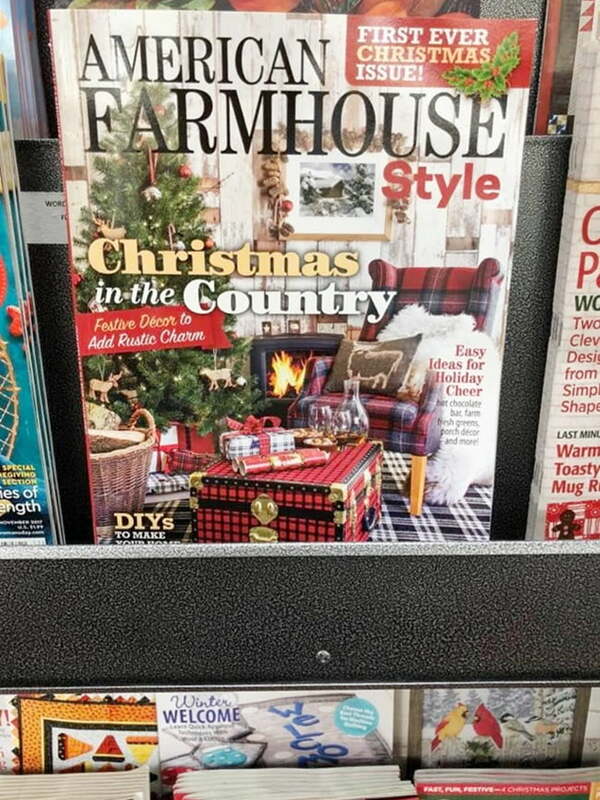 I hope you pick up a copy to celebrate my American Farmhouse Style magazine feature with me. And if you’d like to see the blog post that captured the attention of the editor, click HERE. Congratulations! I love magazines, too. I’ll be on the lookout for this issue. Wow!!! Congratulations!!! What an honor!!! You guys deserve this for sure!!! I love seeing posts from “Cottage The Crossroads” !!! Can’t wait to get an issue of that magazine!!! Congratulations! I am on the hunt for a copy!!! I love all your posts and pics! So excited for you. I am still looking for a copy to purchase. They must be sold out around here! Congratulations…. a well-deserved honor! Congratulations!!! I love all that you do and am so happy that you’ve gotten public recognition! Oh my Jane!!!!!!! Congrats.. well deserved. Your porch is very welcoming and you can tell you just love decorating in your own Style! Your photography looks great!! I love that you decorate with things that you have and give them a treasured spot in your home. Your posts give me ideas… and I think hey I can do that!!!!!! Once again good things come to people who wait. I am so happy for you!!!!!!!!!! Congratulations! How very awesome! Your porch was gorgeous and deserved a magazine spread. I have shutter envy every time I see those red shutters. So very excited for you. Jane, I’m rejoicing with you in this amazing honor given to you. You are definitely so worthy of this special recognition. I see it as a gift from God this Christmas season. I will head out to the newsstand today to get my copy. Yay! Congratulations!!! You so deserve such a special honor. I’m going to pick up a copy!! Jane, I am so happy for you and Leo!! Your style is so wonderful and personal. I love that you two often do things as projects together and affordably. You always inspire me! The photography part is definitely the hardest part of blogging and we all have to keep growing. It’s surely a higher bar than it used to be. Congratulations- this is so wonderful for you! I need to get the magazine and admire all the pictures! I’m a cross between country and traditional. I like you admired all the upscale decorating mags but somehow my roots keep coming back. Thumbs up my friend! I think all of your posts are magazine worthy!! Congratulations on this beautiful feature! Congrats, Jane, and well-deserved! We have a few things in common. I, too, retired after 31 years of teaching, and I, too, was a magazine junkie. Like you, I read all the mags that came to our house when I was growing up…even if the topics were not all that relevant to me. My favorite magazine in my earlier married years was Mary Engelbreit’s Home Companion. I cannot wait to purchase the magazine you are featured in!! I read your feature and congrats!!!! So excited for you!!! A great porch for them to feature! Congratulations Jane. This is awesome. Your home is definitely worthy of being featured. I can’t wait to see it. Congratulations, Jane!! This is huge, and I think you really deserve it. I went to your link and your porch was outstanding. I could feel the warm, homey vibe, especially with your pup lying there so sweetly!! I’m going to go look for the magazine tomorrow!